Close to 3000 people made use of the free medical checkup provided by the 91-member medical team that sailed to the Lomaiviti islands on the Lomaiviti Princess I last week. 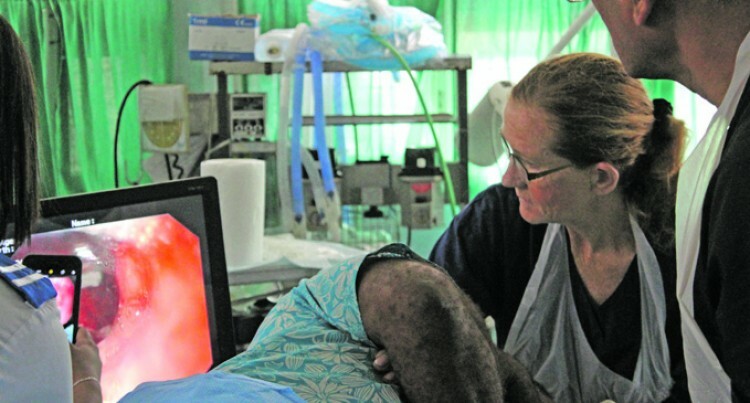 Dr Dinesh Lal (right) and nurse Georgina Voschezang monitor the screen using a gastroscope to check a patient’s internal parts at Levuka Hospital on May 22, 2018. Lomaiviti I was converted to a floating medical camp over five days in the Lomaiviti waters. The vessel, one of the five owned by Goundar Shipping Limited, had left Suva last Monday night for two days on Ovalau and a day each at Koro and Gau. The medical team attended to 657 patients at Delana Methodist School in Levuka on Tuesday, 585 at Bureta on the west coast of Ovalau on Wednesday, 956 patients in Nabasovi in Koro on Thursday and 659 patients in Navukailagi District School in Gau on Friday. This totaled 2857 patients who had the medical services brought to their door steps. During the debrief on board Lomaiviti Princess I on Friday night, GSL managing director George Goundar praised medical team for their voluntary service. “On behalf of the people of Lomaiviti, I want to thank you for sacrificing your time to come here and provide specialised service for our people,” Mr Goundar said. Contingent leader Dr Dinesh Lal thanked the 12 medical services sec­tions individually and sought feed­back from them for an improved vis­it in their next medical tour which they expected to carry out in three months. “Thank you for sacrificing your vacation, your practice and paying for your own fare to come and join the camp (medical visit) for the past week,” Dr Lal said. The team included doctors, den­tists, nurses, technicians and vol­unteers for pediatric and surgical checkups, gastroenterology, psy­chiatry, obstetrics and gynecology, stroke and physiotherapy, optom­etry, dental, dietetics and blood test for diabetic screening for free. The service was provided from health professionals from New Zealand, Australia and Fiji with the sponsorship of Sathya Sai Organisations of Fiji and New Zealand with the Ministry of Health.